Let’s start by considering a very simplified model of a computer, composed of just three parts: random access memory (RAM), which is used to store information; a processing unit, which performs mathematical operations on the information; and a bus, which transfers the data between the two. Schematic of the key parts of a computer. For the purposes of this blog post, let’s imagine that all of the data about the problem is sitting in the RAM and that this data gets moved over to the processing unit via the bus. 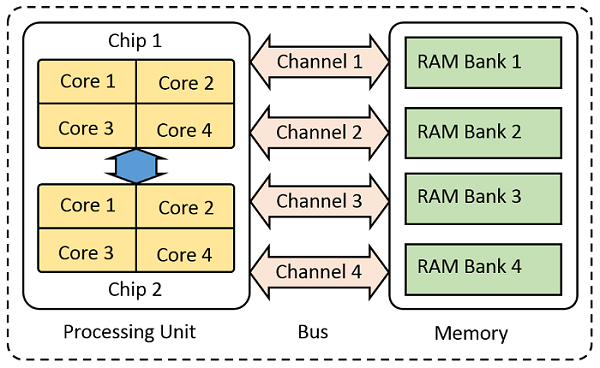 The memory bus itself can be composed of several channels operating in parallel, effectively increasing throughput. The processing unit can be composed of several chips, each of which can have several computational cores that are able to work on data simultaneously, after it has been loaded from the memory via the bus. Let’s use this as our mental model of the computer sitting on our desktop. Many problems in computer science can be thought of as games that we played as children. Let’s look at three of the classics. First, let’s try to find a face in the crowd, á la Where’s Waldo? 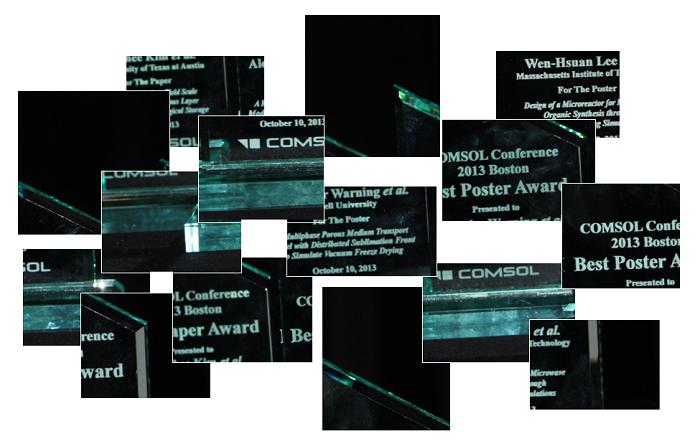 A photo from the COMSOL Conference. Can you find me? Suppose we have a photo with hundreds of people — what’s the fastest way of finding one person? You could scan through the entire image by yourself, checking faces one by one to see if they match the person you are searching for. But, this can be quite slow. You can also invite your friends over to help. In this case, you would first subdivide the picture into smaller pieces. Each person can then independently work on one piece at a time. In the language of computer science, we would say that this game is completely parallel. Having two people working will halve the solution time, four people will cut the solution time in four, and so on. But, there is a limit — you can only have as many friends helping you as there are faces in the crowd. Beyond that point, inviting more people to help won’t speed up the process, and it may even slow things down. Next, let’s try to solve a jigsaw puzzle. Can you put together the image? This is a bit more complicated — you can have multiple people working at once, but they cannot work independently. Each person will take a few dozen puzzle pieces for themselves from the main pile and try to fit them together with the pieces that their friends are putting together. People will try to fit their own pieces together. They will pass pieces back and forth, and they will be in constant communication with each other. A computer scientist would call this a partially parallel game. Although adding more people will decrease the solution time, it will not be a simple mathematical relationship. Suppose you have a 1,000-piece puzzle, and 10 people with 100 pieces each. They will spend relatively more time working on their own pieces and less time talking. On the other hand, if you have 100 people with 10 pieces each, there will be a lot more talking and moving pieces around. And what will happen when you have 1,000 people working on a puzzle with 1,000 pieces? Try that one at home! You can probably see that for a puzzle of a certain size, there is some maximum number of people that can be working it. This number will be much lower than the number of puzzle pieces. Adding more people won’t speed things up noticeably. 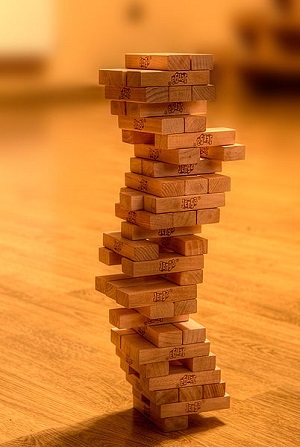 Finally, let’s try to stack some blocks on top of each other to form a tower, and then raise the height of the tower by taking the blocks from the lower levels and adding them to the top without causing the structure to topple over. In this game, only one person can play at a time, and we can say that the game is completely serial. Playing with more people won’t finish the game any faster, and if you invite too many people to play, some of them will never get a chance to do anything. In fact, it’s probably fastest (albeit not very sociable) to play this game by yourself. How Does This Relate to COMSOL Multiphysics®? Partially Parallel — All problems in COMSOL Multiphysics have a partially parallel component. Solving a system of linear equations is a partially parallelizable problem. Thus, no matter what class of problem you are solving, some (usually significant) fraction of the solution time is spent solving a partially parallel problem. For problems where you are solving a stationary, frequency-domain, or eigenfrequency problem only, almost all of the time is spent solving the system of linear equations. Completely Parallel — A completely parallel problem arises when you use the Parametric Sweep functionality, such as when sweeping over a range of geometric dimensions. Each step in the parameter sweep will need to solve a partially parallelizable problem, but each parameter can be solved independently, and if you solve the parameters independently there is no information exchanged between the various cases. Completely Serial — A serial problem arises when subsequent parts of the solution depend on previously computed values. Time-dependent models, models using continuation methods, and optimization problems fall into this category. All such models still need to solve a system of linear equations, but they do so sequentially. The possible speedup is mainly governed by the speedup possible when solving the partially parallel system of linear equations. How Does This Relate to My Desktop Hardware? When solving, COMSOL Multiphysics is spending most of its time solving a partially parallel problem. So, what actually happens in the hardware? The COMSOL software starts with the information about the loads, boundary conditions, material properties, and finite element mesh and generates data that is used during the solution process. Many gigabytes of memory are needed to store the system matrices, generate intermediate information, and compute the solution. Ideally, all of this information should be stored in the RAM. It is worth noting that COMSOL Multiphysics does offer hard-disk based solvers as well, but these will be slower than when data is accessed directly from the RAM. Their advantage is that they allow you to solve larger problems. Of course, this data has to be operated on by the processors, so it turns out that the bottleneck in the solution on a desktop computer is actually the bandwidth of the memory bus — much more so than the processor speed, or even the number of processor cores. Cluster computers are really nothing more than ordinary computers, or nodes, connected with an additional communication layer. Let’s assume that we are working with a cluster where each node is equivalent in performance to that of our single computer. Data passes between the nodes via the interconnect hardware. The interconnect speed is dependent upon not just the type of hardware, but also the physical configuration. In sum, it is usually slower than the memory bus speed on any individual node. This introduces an additional consideration. 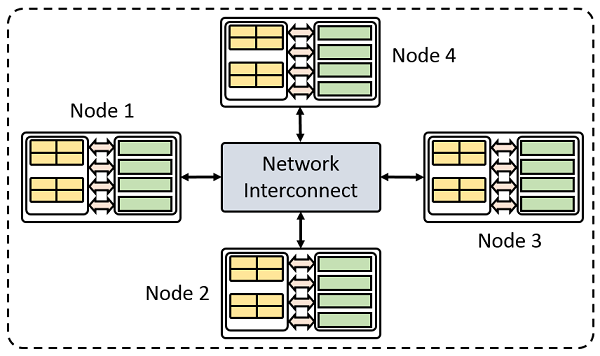 A simple model of a cluster with four compute nodes. We have already seen that the partially parallelizable case is the most important to understand, so we’ll focus on that. On a cluster, we would say that we are solving this problem in a distributed parallel sense. In the context of our game of putting together a puzzle, we can think of this as grouping several of our friends in different rooms of our house, and giving them each a stack of pieces. You would now additionally need to send pieces and information back and forth between different rooms. COMSOL Multiphysics adjusts the solution algorithm to maximize the amount of work done locally and minimize the amount of data that is passed back and forth. These distributed parallel solvers, which are available when you use the Floating Network License, adjust the solution algorithm to efficiently split the problem up onto the different nodes of the cluster. Again, we can see that there is a limit. If there are too many nodes involved, we will just be communicating data back and forth all the time. So, for each particular problem, there is some number of nodes beyond which solution speed will not improve. Now, if you have a completely parallel problem, such as a parametric sweep, where each step in the sweep can be solved entirely within the RAM available on one node, then a cluster is an almost perfect way to speed up your modeling. You could use up to as many nodes as there are parameter values that you want to sweep over. You should now have an understanding of the different types of problems that COMSOL Multiphysics solves, in terms of parallelization and how these relate to performance. When working on a single computer, the performance bottleneck is the bus speed rather than the clock speed and number of processors. For desktop machines, we also publish some more specific hardware purchasing guidelines in our Knowledge Base. 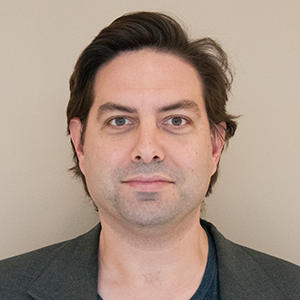 For cluster computers, performance can be much more variable, depending on problem size, cluster architecture, and the type of problem being solved. If you want more technical details about clusters, please see this series of blogs on hybrid parallel computing. Amazon Web Services, the “Powered by Amazon Web Services” logo, and Amazon Elastic Compute Cloud are trademarks of Amazon.com, Inc. or its affiliates in the United States and/or other countries.